This area also doubles as the City of Parsons Council Meeting Room. 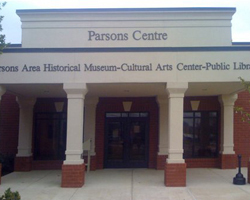 The museum houses historical history of Parsons and the surrounding areas. Parsons Library is a multi-function library with a career center, genealogy area, along with books to meet every need. The library has special programs for the entire family.